What is sleep apnea? Obstructive Sleep Apnea (OSA) which is also known as obstructive sleep apnea syndrome, and Sleep Apnoea is when airflow to the lungs is blocked because the tongue or soft tissues of the throat or soft palate collapse onto the back wall of the upper airway thereby creating the obstruction. This obstruction could be a partial obstruction or it can be completely blocked, which is then known as OSA. People only snore while asleep, the reason for that is our muscle tone is strong enough to keep our airways open while awake. However, when we relax at bedtime, our muscles also relaxes causing our muscle tone in our upper airways to weaken, which can cause it to collapse completely; resulting in Obstructive Sleep Apnea. It becomes apparent that you might have sleep apnea when your snoring is loud and then the loud snoring is followed by episodes of silence where you’re breathing stops or almost stops. Our brains are naturally tuned to alert us in times of trouble, so your brain will give a signal to alert you to wake up when your breathing is out of the ordinary, and then usually with a loud snort or gasp. Almost like a wake-up call from your brain. This can happen many times per night, and it is even not uncommon that there can be several hundred ‘stop breathing and wake-up incidents’ during an 8-hour sleep period. Periods where you stop breathing that lasts longer than 10 seconds per time, can be very serious and you should seek immediate medical attention. This could undoubtedly lead to a situation of feeling chronically fatigued, because you don’t sleep enough. This is then usually the time when most people will look for sleeping pills to help them sleep. 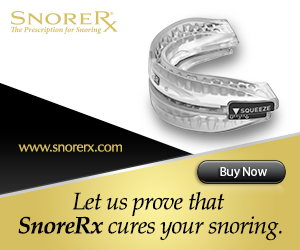 This could be a huge mistake and actually aggravate your snoring, find out why the best sleeping pills is not the best idea. Your partner will usually have to tell you about all your apnea occurrences that happened the night before, as it is unlikely that you will even know about it, all you know is that you are always tired. Central Sleep Apnea (CSA): I mentioned above that the brain’s natural instinct is to protect us, so it will wake you up to breathe when you are not breathing. With CSA however, the brain does not wake you up or send signals to warn you to breath. This is therefore a very dangerous condition which would need immediate medical attention. Mixed Sleep Apnea (MSA): This is a combination of both OSA and CSA. In these rare cases, patients struggle to breathe even after using a CPAP machine, and even after their airways were opened with the help of the machine. Extremely loud snoring, interrupted by pauses and gasps. Chronic daytime sleepiness. E.g. falling asleep with daily activities. Difficulty with focus and concentration. Headaches especially in the mornings. Forgetfulness. E.g. Problems remembering things. Changes in mood or behavior. The symptoms or signs above could indicate possible sleep apnea, but having some of these symptoms does not necessarily mean you have sleep apnea. The reason for this is the fact that some of these symptoms could also indicate something completely different, and will not necessarily mean OSA. If you however have some or all of these symptoms all the time, that is when you show signs that you might really have sleep apnea. Our bodies need proper deep sleep at night, to enable it to recuperate/recharge properly. This period of proper deep sleep is stage 3 of the Non-rapid eye movement sleep period (NREM). OSA causes a situation where you wake up regularly, and then more than likely do not get proper sleep. This can have the result that you get less deep sleep or even no deep sleep at night, which can be very detrimental to your health. Read 10 Ways to Sleep Better if you want to learn more. Deep sleep can be defined as the time when your major muscle groups, such as your heart, get to relax and repair for the next day. If you don’t get enough deep sleep rest, your heart does not get the amount of rest it needs on a daily basis. All doctors will agree that adults over 18 years need between seven and a half and nine hours sleep per night. Apart from the possible risk to our heart health, without proper sleep we can also get irritable, moody, and even develop depression. Without proper sleep we cannot think clearly, react clearly and our work and private lives can suffer. There are still many things that could be said about the dangers of OSA and about the sleep deprivation that goes along with it, but that is however beyond the scope of this article and will feature in future articles. Obstructive Sleep Apnea can wreck havoc on your love life, work life and of course sleeping needs. Our bodies need sleep to recuperate, that is just how we were created, and without the proper rest our bodies will start breaking down. Fortunately our bodies gives us little signals when we don’t take care of it, as we sometimes tend to do. All this small ailments and signs tell us that we need to slow down and rest, and maybe even that we need a holiday. If we ignore these signals, be prepared to visit the doctor. So what do you do if you have OSA, because OSA is one of the biggest culprits of denying people proper sleep? If you are an OSA sufferer, the chances are you will never get a good night sleep, unless you get it treated. Luckily there are treatment options available, such as the CPAP machine, surgery and even some natural remedies that might make a difference. This is however beyond the scope of this article and will be discussed in future articles. It is estimated that around 16% of all people around the world suffer from OSA. If you are one of them, and you believe your symptoms to be serious, make sure you seek medical attention, because OSA is not something to mess with. So what is sleep apnea? I hope you will be able to answer this question now. However please don’t let this information, no matter how helpful it was, be a substitute for seeking a proper doctor’s examination, as Obstructive Sleep Apnea is a very serious condition. Please leave your feed back below if there is something on your mind, or even if you just want to talk to somebody. Yes I will definitely write an article about narcolepsy, where you suffer from extreme daytime sleepiness and often struggle to stay awake for long. I am really sorry about your daughter, being a father myself I can imagine how difficult this must be for you. I wish you nothing but the best.